CogniFit continues to grow its neuropsychological test offering with the launch of a Cognitive Assessment Battery for Insomnia (CAB-IN). This digital test allows for a complete cognitive screening and assessment to help evaluate the risk of having this sleep disorder with excellent reliability. NEW YORK, August 8, 2018	(Newswire.com) - CogniFit, a global leader in the cognitive testing market, has developed a new online cognitive assessment battery designed to help evaluate relevant symptoms and cognitive consequences of insomnia. This digital battery is a professional tool made of clinical batteries and validated tasks. It aims at helping to detect the presence of symptoms and problems in the cognitive processes affected by insomnia. Each night millions of people around the world struggle to fall asleep or stay asleep. 30-35% of adults have brief insomnia symptoms while 10% have chronic insomnia disorder, which occurs at least three times per week for at least three months. Like any other chronic disorder, insomnia can have a negative impact on your physical and mental health. Studies have linked insomnia with a higher risk of developing depression, anxiety and high blood pressure. It has also been linked to cognitive impairment, specifically with significant alterations in executive functions, attention, as well as memory. An insomnia diagnosis requires an exhaustive, multi-disciplinary differential diagnosis in order to discard any symptomatology that may be better explained by the presence of a different sleep disorder, mood disorder, illness, or other problems. 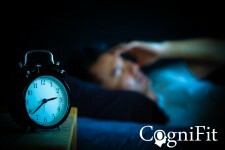 CogniFit cognitive battery for insomnia helps professionals get more information on the sequelae that this sleep disorder might have on the patient. It provides not only information on sleep hygiene, but also the cognitive and associated symptoms that may affect the person's work and/or school performance. “CogniFit cognitive battery for insomnia helps professionals get more information on the sequelae that this sleep disorder might have on the patient. It provides not only information on sleep hygiene, but also the cognitive and associated symptoms that may affect the person’s work and/or school performance,” said CogniFit neuropsychologist David Asensio on the usefulness of this tool in therapy. The CAB-IN assesses three different symptom areas such as insomnia symptoms (poor quality sleep, difficulty falling asleep), sleep hygiene (activities, routines and factors that may affect sleep) and associated symptoms (irritability and lack of concentration). Some of the symptoms of insomnia, sleep hygiene and associated symptoms, come from deficits in different cognitive skills. The CAB-IN generates a full report with a general profile of the user's cognitive skills. This report indicates how severe the cognitive alterations might be due to this sleep disorder. This test is suitable for children 7+, and adults and seniors that may present some risk factor related to insomnia. Any user, either professional or individual, can easily use this neuropsychological assessment battery. The CAB-IN is a professional tool created by specialists in cognitive impairment. All CogniFit cognitive tasks are patented and validated, accessible and easy to use. CogniFit is a leader in neuropsychological testing and cognitive stimulation. CogniFit brain fitness solutions are used and recognized by the scientific community, universities, foundations and medical centers around the world. CogniFit is a global leader in developing online programs to assess and train core cognitive areas such as attention, memory, coordination, perception and reasoning. As a digital health company, CogniFit specializes in scientifically validated cognitive tests and brain training programs, all available online at www.cognifit.com. CogniFit's patented technology has been designed by an international team of scientists, neurologists and psychologists who investigate and combine the latest discoveries on the brain with advanced adaptive algorithms and big data analytics. For nearly 20 years, CogniFit has been developing personalized brain fitness programs with leading scientific institutions and has published its results in several peer-reviewed publications. Today a major vendor in the cognitive assessment and training market, CogniFit offers its programs to individuals and companies in various verticals, such as healthcare, education, research, health and wellness, driving, and human resources. Its brain fitness solutions are available in 19 languages.